Are you leadership fit? I’m not asking whether you can run a mile, do an hour of hot yoga, or do 20 push-ups. Being leadership fit is about being at the top of your leadership game. It requires great balance of both the people and task aspects of leadership. You must be focused, engaged, and adaptive while delivering positive results. It’s about your performance and ongoing personal improvement. It requires you to take an active role in incorporating ongoing development to continuously develop your leadership skills. And it’s about being transformational—both for you and for those you lead. Peak leadership fitness is an aspirational state built on consistently striving toward exceptional interpersonal and technical skills, adaptability through learning, and consistently positive results. It is built by balancing capability, capacity, and mental toughness. It is accomplished through strong and accurate self-awareness and a combination of relevant activities as part of a regular development routine. Peak leadership fitness allows you to bring your full and best energy to your leadership. Peak leadership fitness is dynamic and aspirational because once you realize your potential and achieve your goals, you have a new platform, or baseline, on which you can continue to learn and grow. I think that is great news, because it implies you already have a starting point for your leadership fitness, with the potential to further elevate your leadership. It also implies that you have far greater and ongoing potential for growth. Why Should You Be Leadership Fit? Great leadership is not about you; it is about those you lead. A key aspect of leadership is engaging and motivating the people you lead. Unfortunately, low engagement has reached epidemic proportions. There are multiple studies that show that a significant amount of employee engagement—up to 70 percent in some cases—can be attributed to a person’s leader. This means that if we can get leadership right, we’ll have a real chance to create an engaged workforce. This becomes a force multiplier, too, where your actions inspire multiple people to strive to be their best and bring their best energy to what they do. Now that’s the type of organization and team I want to be part of. However, there is much work to be done when it comes to engagement. Many of those same studies that highlight the importance of leadership to drive engagement also show that as little as 15 percent of employees feel engaged. That is a huge gap with significant implications. When you factor in the lost productivity and associated turnover costs, the implications of low engagement quickly add up. Becoming leadership fit is a major step toward bridging the engagement gap by inspiring those you lead. I have seen this firsthand. People want to connect with a vision. They want to be energized by their leaders. Members of those teams have a tremendous amount of initiative, effort, and commitment. Leadership expert Steve Arneson offers up a profound question that has stuck with me: Do you want to be known as the type of leader who does something to those you lead or for those you lead? Challenge 1: Today’s leaders do not have enough time to focus on development. There are simply too many demands, and development doesn’t just take a back seat—it often rides in the trunk. This is particularly evident with more seasoned leaders who often have so many priorities that leadership development rarely rises to the top. Unfortunately, with the increasing focus on results and demands on leaders’ time, this is only going to become more challenging. Challenge 2: Many leaders don’t know where to start. This is further exacerbated by a crowded leadership development landscape. It has become increasingly difficult to make sense of which activities will yield the best results. Consequently, many leaders become passive participants in their growth— waiting for someone else to serve up their development. Some leaders do nothing when it comes to their development, or worse, they invest their valuable time and money on the wrong activities, which includes anything that does not help reinforce or improve leadership. This can be costly both financially and in terms of misdirected effort and results. Much like your physical health, when it comes to your leadership fitness, what you consume matters. You will not stay healthy by fasting for extended periods or consuming the wrong things. The implications extend beyond time and money to include performance and engagement. It is too easy for leaders to build unhealthy habits around their development and become disengaged from their own growth and performance. The most common unhealthy habit I see leaders engage in is inattention to their development. Most people realize they should focus on their fitness (both leadership and physical), but other priorities often get in the way. Life gets in the way. Over time, this takes its toll and performance suffers. Let me transition to some good news. Leadership development does not need to be expensive or overly time-consuming. Much like your physical health and fitness, though, it cannot be ignored or neglected. You must take action and build good habits. Leadership fitness requires physical energy, emotional connection, and mental toughness. It is about capability and capacity. Capability comes from your knowledge and skills, while capacity comes from your energy and engagement. This all needs to be balanced with mental toughness and a leadership mindset. Your mindset evolves from experiences, feedback, and reflection. The best leaders can effectively manage these attributes and continuously evolve through self-awareness, feedback, and reflection. Peak leadership requires active participation and planning. So, are you working toward your leadership best? Are you bringing your best energy to your leadership? Are you taking the necessary steps to achieve your peak leadership fitness? If you’re not striving for peak leadership fitness, you may not be working out as a leader. 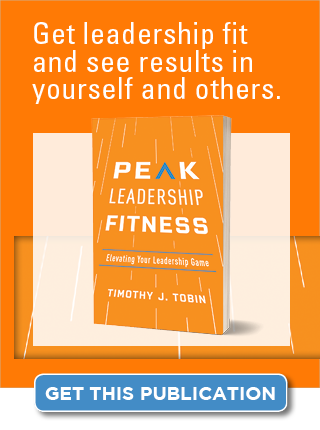 Editor’s note: This post is excerpted from Peak Leadership Fitness: Elevating Your Leadership Game.